About a month ago, I bought a 2016 Yamaha FZ-07. It’s the first motorcycle I’ve bought from a dealership, the second I’ve bought this year, the third in my garage, and the fourth I’ve owned. People always say that after you get one motorcycle, you want two. And after you get two, you want ten. After less than five years of riding, I can relate to that. What can I say? Motorcycles are fun. But more than that, I think many new riders have no idea what they need or want in a bike. 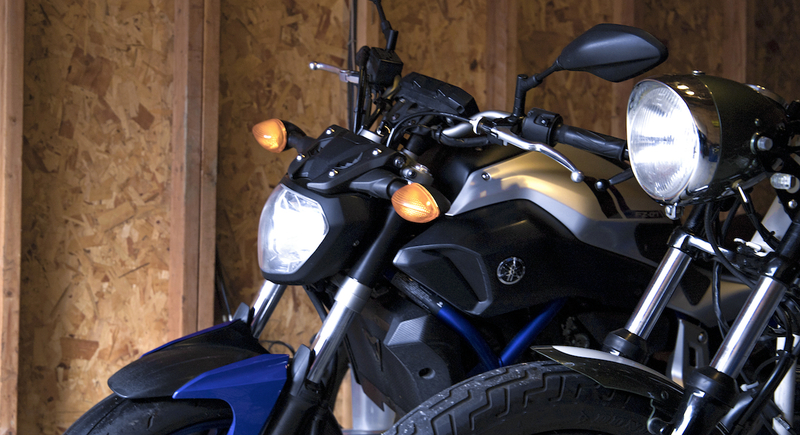 Motorcycles have a lot of nuance, and most new riders don’t understand how those nuances will affect their day-to-day riding. I know I didn’t. Now, I see how much my ideas about “cool” motorcycles influenced my decision to get a vintage bike. I didn’t think twice about comfort, features, or reliability. I wanted the cool factor of an older bike, so that’s what I bought. Of course, I don’t regret my decision at all. Vintage motorcycles opened a new world for me. I’ve loved the process of learning to work on my vintage bikes, and I’d like to think I’m becoming a better person for it. But also, recently I began to realize that I needed a practical bike. I needed a more reliable bike with a more comfortable riding position. I needed a bike I could ride in the rain without fear, and that I could leave parked downtown for an hour without worry. When I first began learning to ride, I had a lot of ideas about how I was going to learn and become a better rider. I watched YouTube videos and made lists of drills to try. At one point, I decided I needed to do parking lot practice once a month. Guess how many times that’s happened. After getting The Little Rat back from the rebuild, I couldn’t help but treat her with kid gloves. I mean, I still rode the bike — I rode her everywhere. But I was so in awe of Sofi’s craftsmanship, I couldn’t bring myself to push my limits on The Little Rat. It hurt to even think about dropping her during a failed low-speed maneuver. Instead, I swept my parking lot practice goals out of my mind, and did what most riders do: built my skills on the street. For awhile, this was fine. But then, I moved to Oregon. Even in the city, Oregon is full of challenging roads, up-hill corners and strange intersections. I soon realized that I had a huge gap in my riding skills that I needed to fill, and soon. I’ve always known that, to stay safe, riders need skills beyond those they use on a typical trip to the grocery store. Skills like swerving, cornering, and emergency breaking — for a start. To learn advanced riding skills, though, you have to challenge yourself. And although that’s something I believed, it wasn’t something I was doing. My excuse? I was too scared of dropping The Little Rat. When I found the Northwest Motorcycle School, which lets students use their bikes, I jumped at the chance to attend. At their one-day clinic, I learned a lot and had a great time, but it confirmed what I had known all along: building advanced riding skills takes regular practice. Practice I knew I would never do on The Little Rat. That’s when I knew I needed a practical motorcycle. Unlike when I bought my KZ or my XL, I had a very specific list of criteria for my new, practical motorcycle. First, I needed the bike to be lightweight and have a low seat height. I’m pretty short for a rider, and I know I’m not yet comfortable enough to handle a heavy bike that I can’t flat-foot. I also wanted a bike that had a comfortable, upright riding position. As much as I love the aggressive cafe racer riding position, it’s flat-out uncomfortable for longer rides. Not to mention, I wanted a bike that could easily reach and sustain highway speeds. Highway speeds are definitely possible with The Little Rat’s 440ccs, but they’re not easy. I wanted my new bike to be at least 500ccs or larger. And finally, I needed the bike to be affordable and reliable. For awhile, I considered getting an older Triumph or BMW off Craigslist. But I always came back to the same thing: I already had two bikes to lavish money and attention on. This one needed to practically take care of itself. When I added everything up, all signs seemed to point to the Yamaha FZ-07. They were very affordable, and everyone I knew who had owned one said they were all-around good bikes. So it seemed like fate when, on a rainy day in early November, I found a pre-owned 2016 Yamaha FZ-07 at a local dealership for less than the blue book price. I hadn’t even gone to the dealership that day to look at bikes: they were having their annual warehouse sale. I didn’t have my helmet or gear, and they wouldn’t let me test ride it because it was raining. But, something about it felt right. I decided to go for it. And so far, I’m glad I did. So… What’s it like to ride? I’ve owned the FZ for more than a month now, and I’d say we’re getting along quite well. It’s very rider-friendly: easy handling, easy acceleration, no fuss, no worries. So far, she’s serving her purpose well as chief grocery-store-run and it’s-drizzing-outside motorcycle. I can’t wait to go on longer rides when the weather warms up, and maybe even a track day or two. Of the bikes I’ve owned so far, it reminds me most of my 2012 Piaggio scooter. It’s so quiet, and so easy to ride, it feels as turn-key as my little blue Fly 150. I have to admit, though, in the days after buying the FZ, I felt an odd kind of remorse. I felt almost as if I was betraying something about myself. If I owned a modern motorcycle, could I still call myself a vintage enthusiast? Now that I’ve had some time to get used to the idea, though, I’ve realized that owning a modern motorcycle doesn’t mean I love my vintage bikes any less. They simply fill different needs. For me, motorcycling has always been about expanding my horizons. And as long as the motorcycles I own continue to inspire me to be a better rider, a better wrencher, a better person… I’d say I’m doing just fine. Doing just fine indeed! Ride your own ride(s), LT. That’s ALL that matters. Bought, Built, Modern, Vintage, Dual Sport, Rocket, Café Racer, Cruiser – labels are just that … words; and the only thing you’re betraying is yourself if you don’t follow your passion and meet your needs; but history, and the very blog upon which I’m commenting, indicate that shouldn’t be a major concern of yours. Now I’ve got my eye on a 2018 HD Sport Glide – though there are about half a dozen home-remodeling projects and a family trip that need to happen first. I want to go cruisin’ with the kid again … my Nic too, once I wear her down with my charms (begging). As the kids say, “Do you,” LT, because the “you” is pretty special; and we’re enjoying this ride you’ve brought us on with you. CONGRATS on the FZ and being bold enough to broaden your horizons! Ride On, and Write On, because you’re Right On! It’s hard to give up bikes that have sentimental value (you know I’ll never part with The Little Rat if I can help it! ), but hopefully you guys will make lots of new memories on the Sport Glide when you get it. I’ve had to put a cap on my bike-buying though… our garage just isn’t big enough to fit more than the four we have now! Plus, my bill for getting the XL parts powdercoated is about to hit… eeeep haha. Thanks again, Ohene. I hope you and your family have a merry Christmas and a happy new year! I’ve ridden the FZ-07 and love it. I would gladly park it next to my Scrambler and use it as my commuter and touring bike. Fantastic engine and it’s just so light and full of character. I hope you’re enjoying it! Mhm, actually it’s not like you want 3, 5 or 10 bikes, you just need 1, maximum 2, one for the daily ride, 1 for longer trips. As for the yamaha, I would have chosen a honda for my part. Reliable is practically perfect, very low maintenance costs (like almost all Japanese), for maintenance the bare minimum, with little extraordinary maintenance. But maybe I’m biased (the first bike I saw was a honda bol d’or 1000, of my mother). Having said this, I find all the legitimate reasoning. Heh, well, if you only really do one style of riding, then one bike might suit you just fine! And, I actually do have a Honda — now I have a Honda (rebuild bike), a Kawasaki (The Little Rat) and a Yamaha 😉 Honda actually doesn’t have a bike quite in this class, the closest might be a CB500X or a CB650F, which are both made a bit differently than what I was looking for. But thanks Matteo, it’s great to hear from you!